After finding that Quentin’s magical portrait is still breathing, Barnabas and Julia realize that they can rescue the missing Quentin. The children reveal where the prior Quentin Collins was buried, and on that spot they exhume Quentin, barely alive. There, they return to Collinwood where they find Daphne with the possessed children, ready to be taken by Gerard. Quentin insists that he and the children stay at Collinwood while Barnabas and Julia take Daphne and leave. Alone with the children, he attempts an exorcism, citing Tad and Carrie as the ‘astral twins’ of David and Hallie. When Gerard appears, Quentin’s victory is short-lived. Gerard incapacitates him with a touch. Later, the children flee to Daphne, but Gerard attacks all three, killing David and Hallie. He conducts his ritual to raise his long-dead crew, and at his command, they storm Collinwood, set on its utter destruction. Meanwhile, Barnabas and Julia discover the attack as well as a now-insane Quentin. As the zombie army grapples with Barnabas, Julia discovers a time staircase and flees. Barnabas is unable to join her when it vanishes from view, and the zombies begin to rend him savagely. At the end of the time staircase, Julia sees Hallie in an undisturbed Collinwood, dressed in clothes of the 1840’s. It’s another quiet day in the news. In fact, the airing of this episode is news in itself. In episode 0001, Burke Devlin welcomes Vicki to the ‘beginning and the end of the world.’ End? What end? Where? Here. 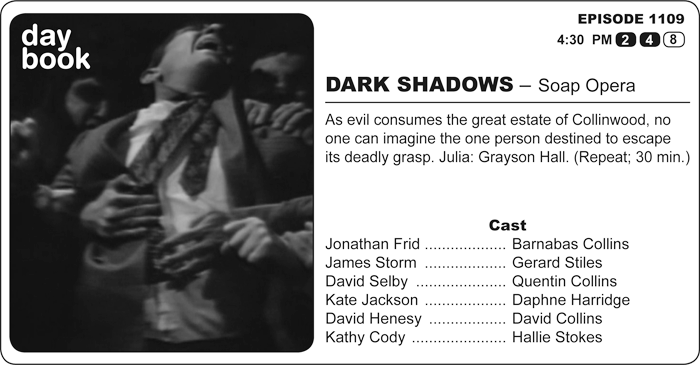 DARK SHADOWS spent a dense month-plus preparing audiences for an apocalypse, but I can’t imagine that daytime viewers were ready for the violent, unforgiving, nihilist spectacle of this episode. The so-called “charter member” stars of the show are now irrelevant to the point of invisibility. It’s up to the three outsiders to Collinwood 1970 to save it, and they fail. In fact, they fail in an inverted order of their ostensible success. Julia, frail and easily paralyzed with fear, is the survivor. Barnabas, bound down by chivalry and zombies, is in second place. And Quentin? Motivated by pride and perhaps a need to atone for centuries of selfishness, he chooses to fight. The result? He suffers the one thing worse than death for a semi-immortal: cowardly madness. And in the face of the quick and senseless deaths of the children in his charge, what other choice has he? The action is so dense as to be nearly incomprehensible. We are distanced spectators to this event. Who would have imagined that Collinwood’s destruction would be a George Romero spectacle as interpreted by Robert Altman? At the center is Gerard at his most remorseless. What’s he doing? Recreating a destruction? Punishing the dead? Pulling the wings off flies is more like it. The puppet of Judah Zachary, the desire is to simply see Collinwood burn and to punish those who’ve tried hardest to save the Collinses again and again. Evil succeeds… almost. There’s one x-factor for which it can never prepare. In any age, across any dimension, against any threat, there’s one name you can always count on: Hoffman. And Dr. Julia Hoffman will return in DARK SHADOWS: 1840.